Now, that’s pretty. I guess the cover might be tweaked still, but this is the one in the Orbit fall catalog, so probably not that much. I don’t know, does it totally look like a romance? I think the rose in particular makes it look very romance-y. Don’t want to disappoint readers, but the romance aspects, while there, are not usually front-and-center in these three books. I do like a romance, actually, but I kind of like to put it in around the edges, you know? And I particularly like to shift the romance off in a surprising direction rather than just having the first male character you meet fall in love with the first female character you meet. Though sometimes the characters make their own choices about that. In fact, in Book III, the characters made me change my mind about who was going to fall in love with whom about page 400 and had quite a bit of tweaking to do to adjust the whole book to fit the new romance. 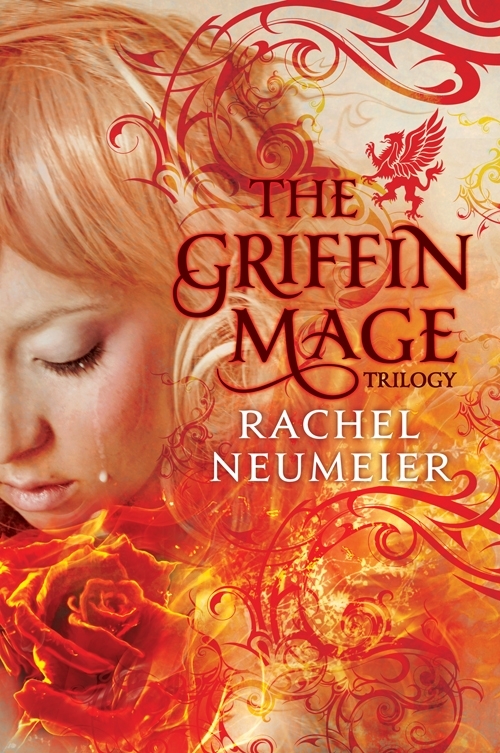 The Griffin Mage books are interesting because I switched main characters with each book, though continuing characters play minor-to-important secondary roles as we go on. It’s like what Sharon Shinn did in her Archangel series or what Jemisin did in The Hundred Thousand Kingdoms trilogy — which I loved and nominated for a Nebula, by the way, and I was delighted to see it on the ballot — but what I mean is, same world in each book, but a whole different take on events because the main characters change. I’ll have to ask Sharon if that was a deliberate decision on her part. For me, given the way Book I worked out, I really couldn’t make Kes the continuing main viewpoint character for the whole trilogy. But I had another problem also, because when I was just starting Book II, I had just finished a YA novel (The Floating Islands), and I had an enormously difficult time thinking of an adult, not YA, character and plot. Finally I declared: FINE, the main character, whoeverhe is, is FORTY-TWO. That solved the YA problem and let me get on with it. And it worked great. Gereint from Book II worked beautifully for me from the first scene straight through the book. And so did Lady Tehre, actually, though she didn’t walk on stage until much later. And once I’d chosen different main characters for Book II, of course I was inclined to do the same again for Book III. Worked again, too. Honestly, I love long series where one character is the main viewpoint character for book after book, but I’m starting to wonder how the author does it. At least for now, it seems more natural to me to switch off. Previous PostIndy pics	Next PostI’ve finally caught up . . .